Are you watching the Tour this year? Not that one in France, the Tour, the Tour of Utah. Held in our own backyard, the 2010 Larry H. Miller Tour of Utah presented by Zions Bank promises world class bike racing. The race has a reputation for being the toughest stage race in the country. Held over 6 days, from August 17-22, with 30000+ feet of climbing over 300+ miles, the Tour of Utah will test the mettle of even the most seasoned professional. This year’s race opens with a prologue at the State Capitol building, then flows into two tough road races, a time trial, a new criterium in Park City, and finishes with the epic Queen stage that travels from Park City to Alpine Loop, Suncrest, and then finishes at Snowbird after climbing Little Cottonwood Canyon. Cycling Utah, in conjunction with the Tour of Utah, presents this guide for you to use when watching the Tour. Stage descriptions are below, along with maps of the road race stages. A good spot to watch the race is at the finish of each stage, where you can enjoy the expo before the riders come in. Or, go to one of the hot spot sprints (orange flags on the maps) or any of the mountain top summits (especially those marked with a red star) to see riders sprinting for points for the orange sprint jersey and the polka dot mountain jersey. Follow the jersey competitions as riders compete for these coveted garments. While you are waiting look for sponsor cars to roll through with water and other swag. To keep tabs on the race while it’s happening, download the Tour of Utah’s iphone app, or follow the race on twitter @thetourofutah, or search for #tou and #tou10 in the feeds for posts from the caravan and spectators. Race updates will also be broadcast on KFAN 1320 several times per hour during the race. 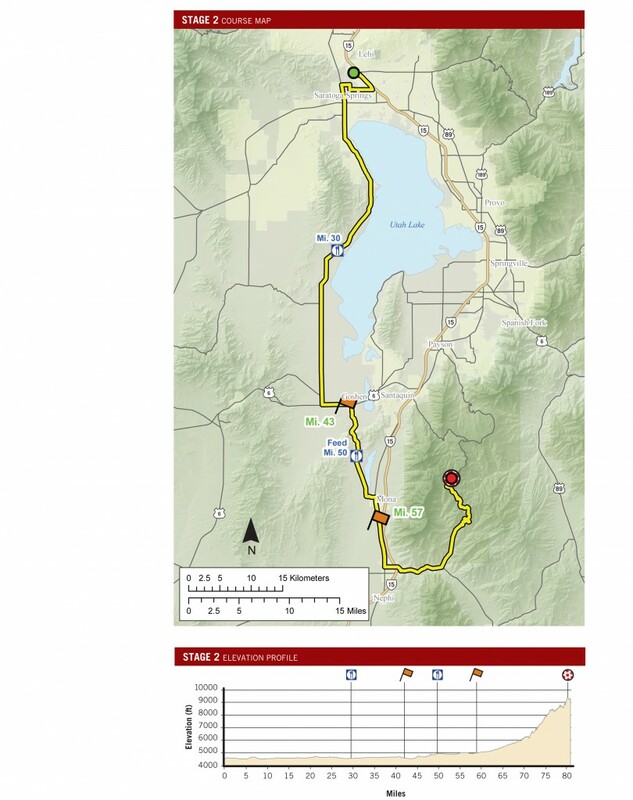 Visit tourofutah.com for other useful information. Make sure that you are in place at least 20 minutes to 1 hour before the caravan is slated to roll through, otherwise, you may not make it to your favorite spot. When you are out and about at the Tour, please remember race organizer Terry McGinnis. Terry passed away last fall after a long battle with cancer. Terry’s presence will always be felt at the Tour, and he will be remembered fondly. Enjoy this year’s Tour of Utah! It’s going to be a good one! The Prologue is dedicated to the memory of Terry McGinnis, former executive director of the Larry H. Miller Tour of Utah, presented by Zions Bank. 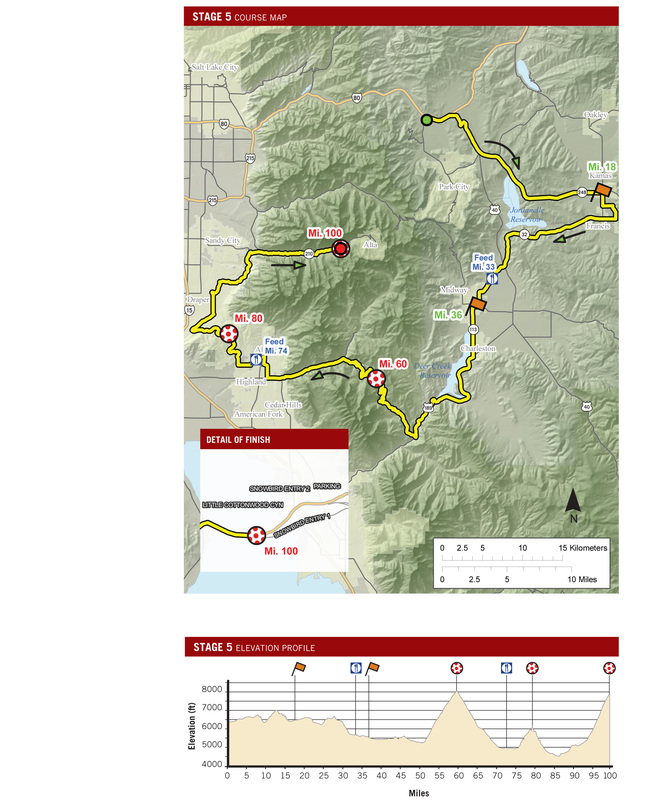 This year’s Larry H. Miller Tour of Utah Prologue features a 4.5 km out-and-back that gently climbs and descends one of the most beautiful—and popular—road cycling routes in Salt Lake City. The course starts in the shadow of Utah’s magnificent Capitol dome on a boulevard that enjoys a 360-degree vista of the entire Salt Lake valley and urban mountainscape. Turning onto a false flat, it hugs a steep hillside, passing the entrance to City Creek Canyon and continues on to the eventual turnaround near the top of Utah’s famed Avenues neighborhood. The course returns to a finish that is just beyond its starting point for a fast, furious and thrilling bicycle racing hors d’oeuvre. Where to watch: Anywhere along the course, but especially at the start/finish and at the turnaround. Expo Hours: Start: 9:30-11:30 a.m.; Finish: noon – 3 p.m. The real racing starts today near the mouth of Ogden Canyon, with this deceptively difficult mountain route. Facing two steep climbs, riders will find keeping their attention on the race will be especially challenging given the stunning canyon scenery. Looping through the high-mountain valley that surrounds Pineview reservoir, the route ascends a steep, winding, two-lane road to Snowbasin Ski Resort, site of the 2002 Olympic downhill ski events. The course then rolls along through the emerald ranches and farms of Morgan Valley, climbing to East Canyon Dam and reservoir. At this point, slightly more than halfway through the stage, riders now face the toughest climb of the day and one of the most difficult of the entire race, Big Mountain. Rising almost 2,000 feet in just over six miles, this climb is guaranteed to separate the climbers from the pack, breaking the peloton apart in time for a final fifteen-mile downhill dash to the line in University of Utah Research Park. Where to watch: Good spots are at mile 29 (Snowbasin) race arrival: ~12:23pm, the sprint at mile 21 (~11:57), the summit of East Canyon (~2:14 pm), the summit of Little Mountain (~2 pm), and the finish in Research Park (~2:46 pm). Stage 1 turn by turn descriptions with arrival times. Beginning, as it does, on the flats east of Utah Lake, the Stage 2 profile may appear relatively benign (outside of an enormous spike over the final twenty miles.) Riders may think they will find relief from yesterday’s tough Wasatch Mountains in those first fifty miles until they start the long grind to the finish line, 4,000 feet above the low point of the course! Mt. Nebo is a classic, local climb that will bring out the mountain goats in the peloton: the slightly-built, ectomorphs whose power-to-weight ratios qualify them as freaks of nature. They’ll need it all, as this climb seems never to end! The overall will surely begin to take shape after this amazing stage. Where to watch: either of the hotspot sprints at mile 44 (~11:41 am) or 59 (~12:15 pm), or at the finish at the summit of Mt. Nebo (~1:19 pm). Stage 2 turn by turn descriptions with arrival times. Expo Hours: 5:30 – 9:30 p.m.
Miller Motorsports Park, 40 miles west of Salt Lake City, will serve as a fitting venue for this year’s race of truth. This track is regarded as one of the finest, safest, most spectator-friendly motorsports venues in the world. The 2010 Larry H. Miller Tour of Utah 14.8 km Individual Time Trial will use every bit of MMP race course, and then some. It’s a supremely fast, twisty, and easy-to-watch course that will give spectators visual access to nearly the entire race. Where to watch: Anywhere on the course. View the action from the deck or from the start/finish. Bring binoculars to get a view of the riders as they face the race of truth. Expo Hours: 9 a.m. – 6:30 p.m.
Where to watch: Anywhere on the course, especially Main Street. Walk around to different points on the course. Look for prime sprints and the finale at the start/finish line. Enjoy the expo. Arrive early and watch the amateur crit featuring many of Utah's top racers. Expo Hours: 12:30 – 4:30 p.m. Stage 5, also known as the “queen” stage, kicks off from the Newpark Center in Kimball Junction. Rocketing into Park City, racers will turn east to race across the ranches and rangeland of Summit County. Turning back west, riders enter what seems like another country, the Swiss-inspired town of Midway. After briefly skirting Deer Creek Reservoir, the race plunges down Provo Canyon, then turns sharply uphill as it passes Robert Redford’s Sundance resort, where it begins to climb the difficult Alpine Loop. This legendary Utah route ascends through narrow stands of aspen and fir trees, crests a saddle just under the summit of Mt. Timpanogos, and plunges down a twisty, narrow highway that rivals the Alps for sheer beauty and danger. Descending back into and through suburbia, riders suffer up a “small” bump over Traverse Ridge before they have to tackle the deciding 8-12 percent climb up Little Cottonwood Canyon to the Creekside Center at the Snowbird Ski & Summer Resort. 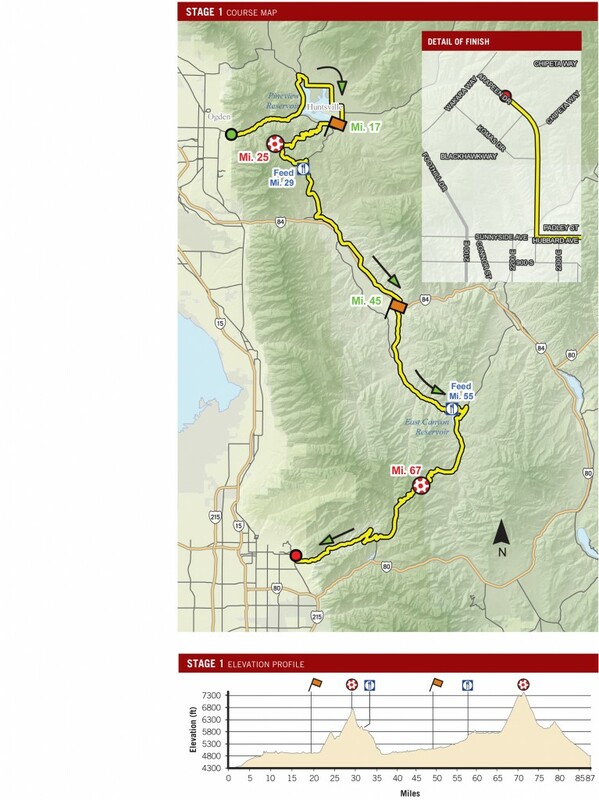 The Larry H. Miller Tour of Utah, presented by Zions Bank will also include a non-competitive ride for cycling enthusiasts the Saturday prior, called “The Ultimate Challenge.” The Ultimate Challenge will be held on August 14th and follows the exact same route as the queen stage. Where to watch: Go to any of the mountain tops or climbs to watch the race unfold. Sprints are at mile 18 (~11:39 am) and 36.5 (~12:20 pm). Riders will be at their limit and working to make the race or break their opposition. The climb on the backside of the Alpine Loop (KOM at mile 60, ~1:34 pm), the climb up Suncrest (KOM at mile 80, ~2:17 pm), or the climb up Little Cottonwood Canyon will provide great viewing. Or, hang out at the finish at Snowbird (mile 100, ~3:19 pm) and see what promises to be a showdown for America's best climbers. Stage 5 turn by turn with arrival times. The origins of the Yellow Jersey go back to the first sponsor of the Tour de France, L’Auto, a daily newspaper printed on yellow paper. The yellow jersey is awarded at the end of each stage to the rider with the best general classification time (not necessarily the Stage winner) and to distinguish the overall race leader. Best overall time is the lowest cumulative time for all Stages. This jersey will be awarded to the overall winner of the Larry H. Miller Tour of Utah. The sprint competition adds a level of excitement to the race; it is often called a “race within a race.” Sprint points are awarded at designated sprint lines on a course and awarded at the stage finish. The rider with the most sprint points is awarded and retains the green jersey until he is no longer the point leader in the sprint competition. Intended to reward and encourage the young lions of cycling, the Best-Young Rider jersey competition is for all participants under the age of twenty-three. The best young rider jersey is awarded to this age category for the rider with the lowest cumulative time. The Larry H. Miller Tour of Utah has some of the most intense climbing terrain in North America, drawing the media’s focus. The King-of-the-Mountains Jersey is awarded to the rider who accumulates the most points by being one of the first three riders crossing KOM check-points at the top of all significant mountains throughout the course. The Best Utah Rider competition is for all participants who call Utah their home a minimum of 180 days each year. This jersey will be awarded to the rider with the lowest cumulative time.